For hundreds of years between the early 1300s and early 1800s, gunpowder was the only propellant. Composed of 75% oxygen rich potassium nitrate (saltpetre), 15% charcoal, and 10% sulphur (brimstone) it is an explosive that generates a great amount of gas in a very short time. To make gunpowder, the ingredients are first purified as far as possible and then ground into a fine powder before being carefully weighed out and mixed in a revolving drum. This ‘green charge’ is then moistened and incorporated using large stone wheels (edge runners) rotating in a basin. 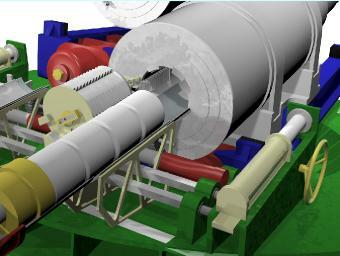 The edge runner wheels produce a combined crushing, grinding and mixing action. These powder mills were initially powered by water wheels, but in later years steam power was used. It could take up to 8 hours to completely incorporate a batch of powder, and for safety reasons, these batches could be no more than 40 lbs (18 Kg). Once fully incorporated, the powder was in the form of a hard ‘mill cake’ which was then broken up into the required sized grains. Small-grain powder has a large igniting surface, and when loaded in a large gun would be totally consumed before the projectile has moved far from its original seat. This produced a highly dangerous peak pressure, which could easily burst the gun. By increasing the size of the grain, less burning surface was exposed and the pressures built up more slowly. 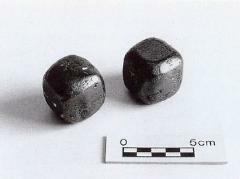 The largest grains were produced by simply cutting the mill cake into cubes to form ‘Pebble powder’. The introduction of armour plate on warships by the French in the Crimea war started an arms race. If the Royal Navy was faced with an armoured ship, it needed a gun that would penetrate the armour and to penetrate armour requires a heavy, fast moving projectile. The weight of a spherical cannon ball is constrained by its diameter, so to increase the projectile weight, either the bore of guns had to increase, or the projectile had to be changed to a cylindrical projectile. The problem with cylindrical projectiles when fired from smooth bore guns was that they topple end for end, so there is no guarantee that the sharp end would strike the armour plate first. The solution was to rifle the barrel, so that the projectile was spinning on its longitudinal axis when it left the muzzle. It has long been known that a spinning projectile was more accurate, and the gyroscopic effect keeps the projectile from toppling. But, as the size of the projectile increased, so too did the powder charge needed to propel it at the velocity needed to penetrate armour. Larger charges would result in much higher peak pressures inside the gun unless the powder could be made to burn more slowly. Pebble powder was not sufficient. One solution was to use an hydraulic press to form the granulated gunpowder into prisms. 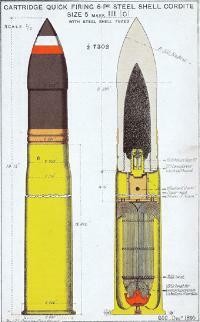 These had a hole at the centre, the idea being that as the prisms burnt from the outside in and from the inner surface out the burning surface remained roughly constant, so gas would be generated at a relatively constant rate, and the projectile given a steady push up the barrel, instead of the short sharp ‘kick’ produced by the fast-burning powders. The guns were then designed so that all the prisms would be consumed by the time the projectile left the muzzle. To get a high velocity from a slow burning powder required the gun barrel to be lengthened so that the burning powder could give an even, low, continuous pressure on the gun and projectile. This caused a problem for rifled muzzle loading guns, the longer barrels would not recoil far enough within a turret or armoured battery, and so would have to be loaded from outside the armour, thus exposing the loading crew to enemy fire. 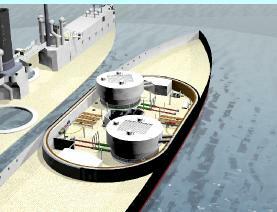 Additionally, loading a heavy shell into a long barrel from the muzzle required hydraulic assistance. Rifled Breech Loading guns were the only solution. This was a time of great technological innovation and ship builders were constantly trying to increase the thickness of the armour to resist the larger guns, while the gun manufacturers were developing ever larger guns to defeat the thicker armour. Very soon the gun sizes, projectiles and powder charges increased to the extent that the initial pressure inside the gun was too great when using prisms made from conventional gunpowder. To make the powder burn more slowly, ‘Cocoa powder’, so called from its cocoa-like colour, was developed. The constituents of cocoa powder are: Saltpetre 79%, Charcoal 18% and Sulphur 3%. The charcoal was now made from straw carbonised by steam. Cocoa powder pressed into prisms is referred to as ‘Prism, Brown’, and this is the type of powder carried by HMS Colossus for her 12 inch Mk IV rifled breech loading guns. A still slower burning powder was needed as guns increased size to 13.5 and 16.25 inches. Slow-burning Cocoa (SBC) was adapted from Prism, Brown by small alterations in its composition. The full charge for one of Colossus’ 12 inch guns is 295 lbs of Prism, Brown. This ‘battering’ charge, used when firing against armour, is made up of four cartridge bags made from silk cloth, each holding 73.75 lbs of Prism, Brown powder. If great penetrating power is not required, such as when firing against unarmoured ships, then a reduced or ‘three-quarters’ charge is used – three cartridges. For general practice a half charge would be used. Silk bags are used since this material is entirely consumed when the cartridge is fired, otherwise a burning residue could be left which might cause a premature explosion when the next cartridge was placed in the gun. 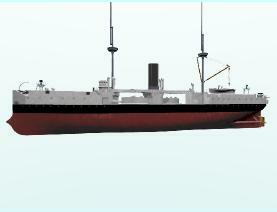 In the late 1880’s a new threat emerged in the form of small fast torpedo boats (as advocated by the French ‘Jeune Ecole’ tactical thinkers), and to counter them, ships would need to carry a large number of small, fast firing guns. These ‘Quick Firing’ (QF) guns used a combined shell with attached cartridge case made from brass. However, they still used gunpowder, which produces an inordinate amount of smoke. The principle of quick firing would be negated if the target is hidden by the smoke of the first few shots. There was a need for a smokeless propellant. As usual, it was the French who lead the way in developing a smokeless propellant. Britain followed by developing ‘Cordite’, and after long litigation on patent infringements, this propellant quickly replaced gunpowder in all major guns in the Royal Navy.